This image shows a comparison of temperature difference data for the US that should be the same data set. The purple thin line is the archived data from web.archive.org which was archived May 7, 2001. The thin red line is the live data taken on December 19, 2014. The thicker lines are the 5-year means plotted against the middle year (e.g. 1971 – 1975 plotted at 1973). The dotted lines are second order polynomial fit curves to each raw data set. Based on what I see, someone is modifying historical data. 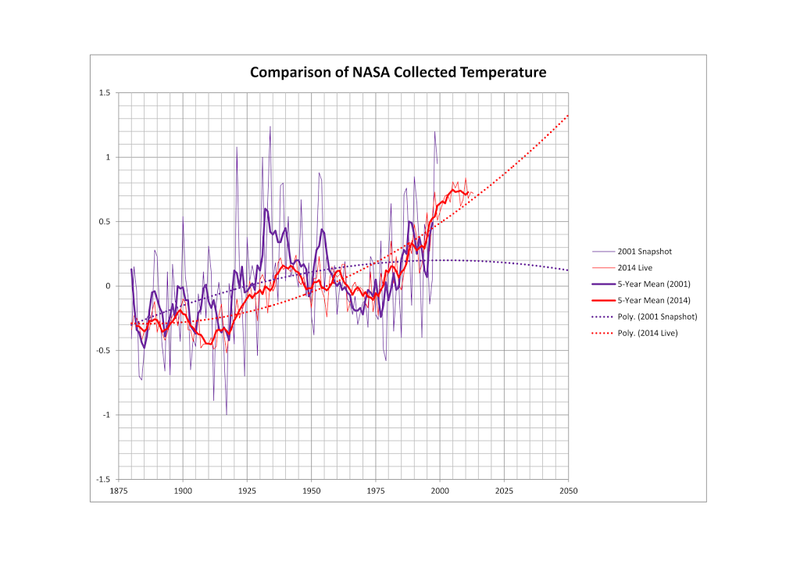 In general temperatures prior to 1970 in the 2014 data set are lower than those same years in the 2001 data set while temperatures after 1970 from the 2014 data set are higher than those same years in the 2001 data set. The effect of that data is dramatically illustrated by the fit curves, the early data suggests a leveling off while the later data set suggests a run away system. This entry was posted in Mike.